Great Cocktail Recipes: Saturday Shots - 10 of the most popular bar shots! Saturday Shots - 10 of the most popular bar shots! 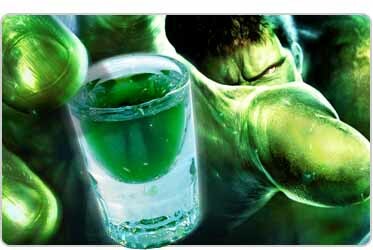 ^A popular and strong shot called the Incredible Hulk!!!! Now for 2nite's agenda!! Woot! Today's topic is going to be on shots obviously, but we are bringing you some of the most popular shots. There are countless ones out there but these are more of the frequent ones I see! Enjoy! Please be safe! A very cool kind of mellow easy going shot. Even though,I'm not a Jager fan, the popularity of this shot is not to be ignored. Perfect to take these right on St. Patrick's Day! Very popular and sweet! Ladies love these. Another cool shot. I had a few of these back on St. Patrick's Day. Man, I was twisted. hahaha. Another great shot. Kind of strong, too. Peep it. A really cool shot you take from the straw. One of the strongest shots, drinks, whatever you wanna call it! It's POTENT, yo!